Divertiti con un tour in Segway di 3 ore e mezza per le meraviglie dell'Antica Roma. Unisciti a un piccolo gruppo di partecipanti in un tour in piedi motorizzato alla volta dei siti storici più famosi della città, tra cui Foro Romano, Colosseo, Circo Massimo, Terme di Caracalla e non solo. Potrai visitare luoghi mai visti e sfilare lungo le misteriose rovine antiche a bordo della biga più moderna del mondo: il Segway PT. Scegli di aggiornare il tour con un esclusivo biglietto di ingresso saltafila per il Colosseo, il Foro Romano e il Colle Palatino per un tris di visite autonome. My husband and I loved this tour! Our group was small and our guide (Eddy) was excellent! We got to see parts of Rome we would never had seen on foot or on our own. And we got to take in so much in just a few hours. Highly recommend this! Spring Break in Italy meant extensive research and planning so that we could see everything while traveling from Venice to Florence to Rome to Naples to the Amalfi Coast. SO, the EcoArt Segway Tour was the absolute best way to catch the highlights of Rome while efficiently using our time. Eddy was our tour guide and gave us an adrenaline fun-filled overview of Rome, allowing us to see every highlight plus more that we had researched. We were well trained on the Segway, so our family navigated every terrain Eddy took us on. We went through crowds with ease, travelled along sidewalks to get to the perfect spot for viewing, and maneuvered through traffic without concern because Eddy had prepped us well and took the lead. We saw more in these few hours than humanly possible if we had tried to walk it. Plus Eddy was able to share history and stories at each stop. It was amazing! We did not choose the Colosseum Entry because we had secured the Colosseum Underground Tour, which was fantastic. The Segway tour was a great deal of fun and I would certainly recommend it to others. Eddy, our guide, was entertaining and informative at our stops, and kept us out of trouble as we navigated the streets. I was anxious, as I was almost certainly above the weight limit for a Segway but he had me up and running with very few problems. The Segways are perfect for covering a lot of ground in a limited amount of time. A few things to remember about a tour of this type: Although there are stops for information and photos, the major ingredient of the tour is the experience of cruising through the streets don't expect to dismount and spend time at the majority of the sites that you will see. Just be aware of this in advance it is the usual tradeoff for covering a lot of ground in a short time period. I did notice based on the photos posted here by other tour participants that other groups visited sites that we didn't get to apparently other riders got to get close to the Pantheon, the Senate, etc. which we never approached. Perhaps it was too cold on the afternoon of our tour, or getting too dark, but I did feel that we had missed some of the stops that other people made. My recommendation still stands: the staff was very friendly and accommodating, the guide was excellent, and the experience was very worthwhile. Unfortunately it was pouring on the day of our Segway tour, so they put us in a luxury van with our tour guide to see Rome. Still was able to see everything and learn the history of the items that we toured. Had a blast with the three other tour members that were from Australia. Alex, the tour guide, was very knowledgeable and answered any questions we had and allowed us plenty of time to take whatever pictures we wanted. Was able to get some great pictures even with the rain! Would definitely recommend this tour! Outstanding tour which included great views of Rome. Flavio our guide was absolutely wonderful. He was very patient with us as we leavened to ride a Segway for the first time, and he was incredibly knowledgeable and pleasant. I can’t imagine seeing Ancient Rome any other way. Fantastic experience. We went to places we hadn't been before, and learned more about the places we had previously visited. Also a few useful tips on where to go to see more. 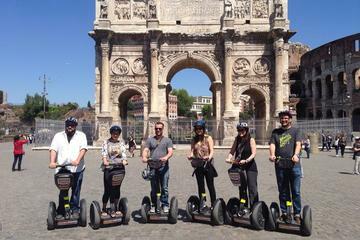 The Segway Tour was one of the events I was looking forward to more than any other part of our Rome adventure. The organization of the whole event was very well done. We had time to practice before going out with the Segways. I am 68 and had some anxiety about riding a Segway. Simiel was a good leader in that she was easy to follow, especially when we were riding through traffic or a lot of people. She was clear in her explanations. Since it was my first morning in Rome, we were not familiar with some of the places she took us, but understood all of them once we had time to spend more time at the Colosseum, the Forum and Rome. Our guide kept me very close to her which was very helpful. I had a little trouble with my Segway because I was not standing up straight enough. I needed to use the handle as though it was a joy stick. Once I stopped leaning in the direction I wanted to go, I could control the Segway without a problem. It was exciting and fun!